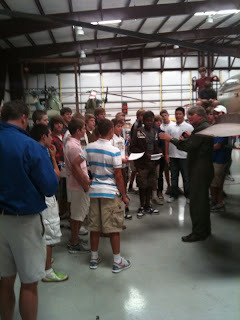 History lessons at the Cold War Air Museum are made easier by the availability of so many resources on the web. One of our frequent contributors forwarded the following pictures on the "pre-cold-war" science of aircraft spotting. 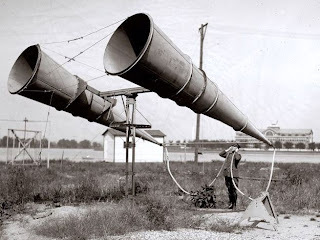 With the advent of stealth technology, the old however may become new again. Early warning of approaching aircraft was recognized as a priority as early as WW1. Before radar, one of the methods that was used was sound detection. 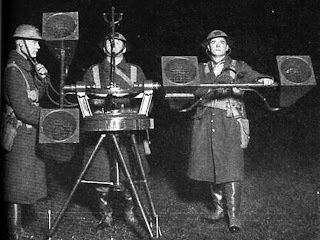 Before modern electronics, these "ear amplifiers" might be manned (literally) to detect the sound of noisy aircraft engines approaching. As is so often the case, warfare drove the advance of technology. 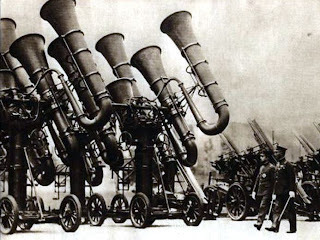 Here the amplifiers were "miniaturized" by folding the hearing tubes (into a trumpet shape)and by making them "portable" by mounting them on trailers. In the early stages of WW2, radar was not yet perfected and all sides developed and used sound tracking as an early warning aid. 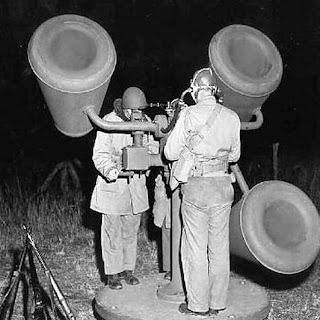 Like early radars, instructions from sound directors would be passed to banks of search lights. 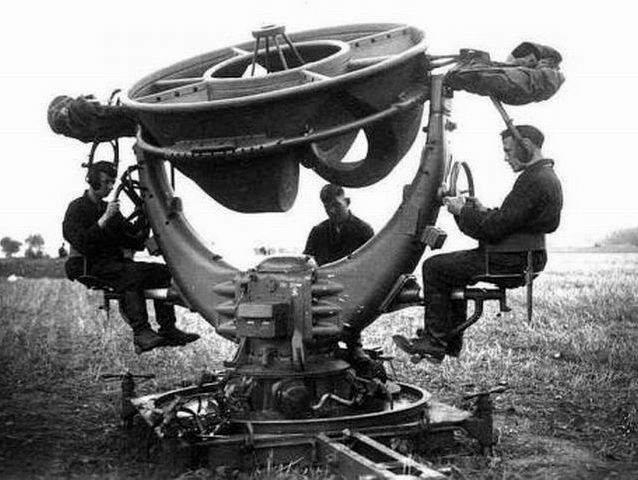 Actual targeting of an aircraft was done visually from the anti-aircraft gun position, after the aircraft was illuminated. Air Raid warnings saved many lives by allowing personnel to take cover before the arrival of bombers. 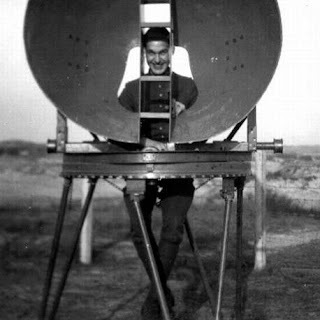 Driven by the demands of war, the rapid development of radar soon obsoleted aircraft spotting by sound. Thanks Phil for sharing this history lesson with us. Fun and food are also an occasional part of Cold War Air Museum fare. This morning's preflight was for a very special event. The Mi-24 and MD500 were off to a North Texas Ranch for some good home style Texas Barbecue. A good mechanic is a man of many talents. 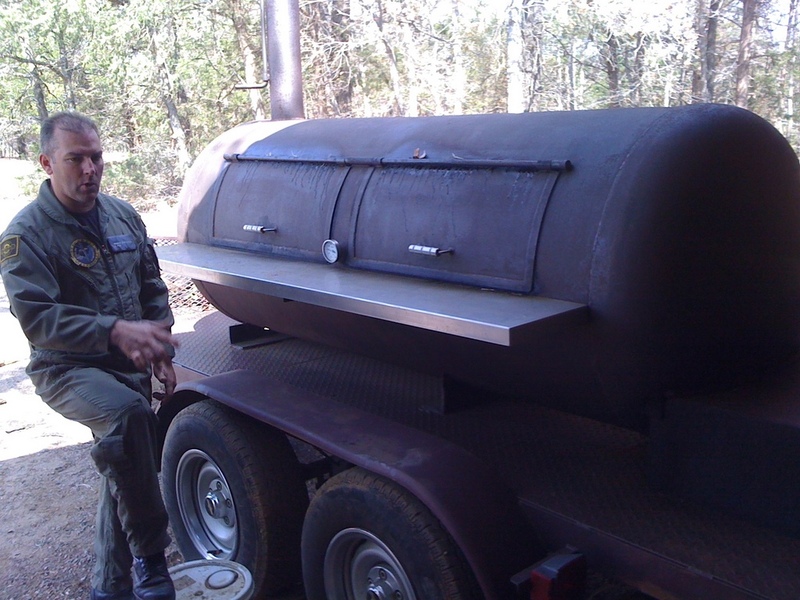 In addition to being an A&P/IA and Commercial rated Helicopter Pilot, Johnny, like all adult Texas males, is also able to make a situation assessment and preflight of barbecue cookers when necessary. 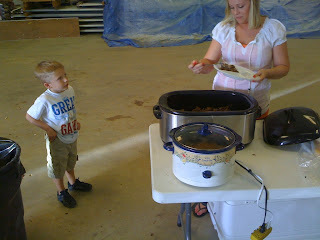 Of course, it took several helpings of brisket before the final analysis was in - good cookin! Good barbecue is a Texas tradition, combining it with the arrival of a giant helicopter hopefully made it a memorable day for this young man. 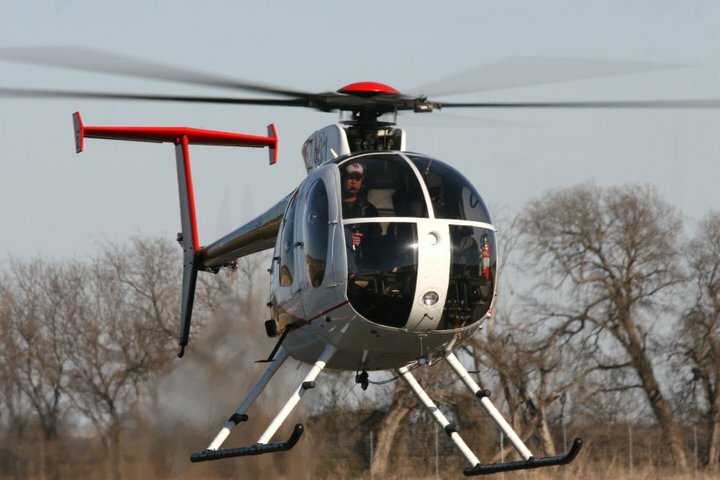 Any helicopter attracts attention, but the Hind attracts "Texas" size attention wherever it goes. 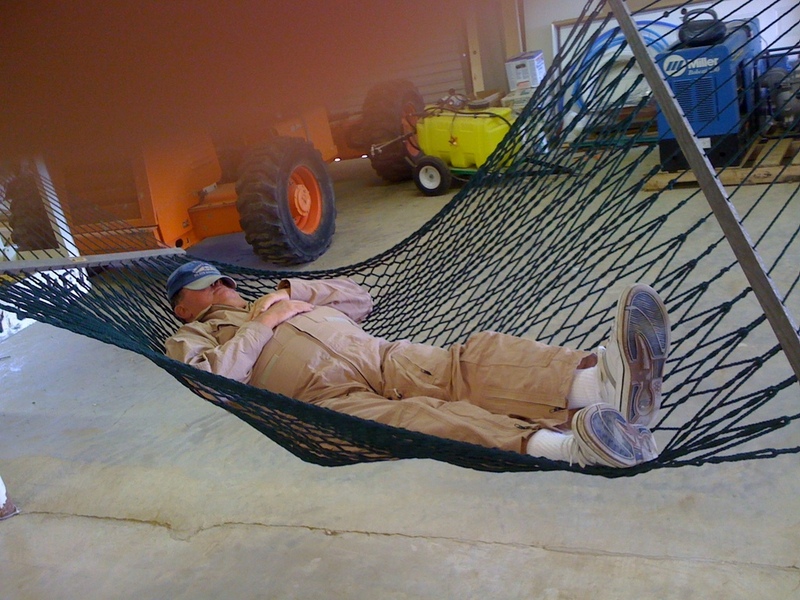 After some heavy lifting, this director had to take some time out to digest the situation. If we could sling a couple of these in the back of the Mi-24, it would definitely make the ride home smoother and quicker (for a few of the crew, anyway). 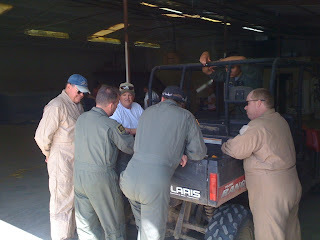 The return flight was briefed by the boys in the barn. Ready to go, the two crews had some more promises to keep on the way back to town. The landscape in Texas is dotted with former Air Force Bases. 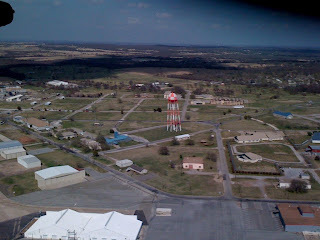 Now a regional airport at Dennison, Texas, the Former Perrin Air Force Base is recognizable, like so many old military fields by it's checkerboard water tower. The crew had spoken with the tower on their way North and promised to come back by as they flew home. With a great big Texas Howdy!, we salute the tower crew for their courtesy and assistance. We are proud to be in a state that is so often recognized for it's friendly folk. 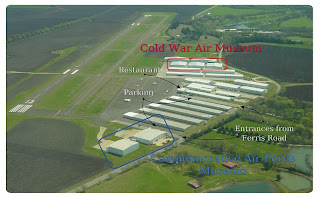 Come visit the friendly folks at the Cold War Air Museum or contact us to be part of your event in our area. 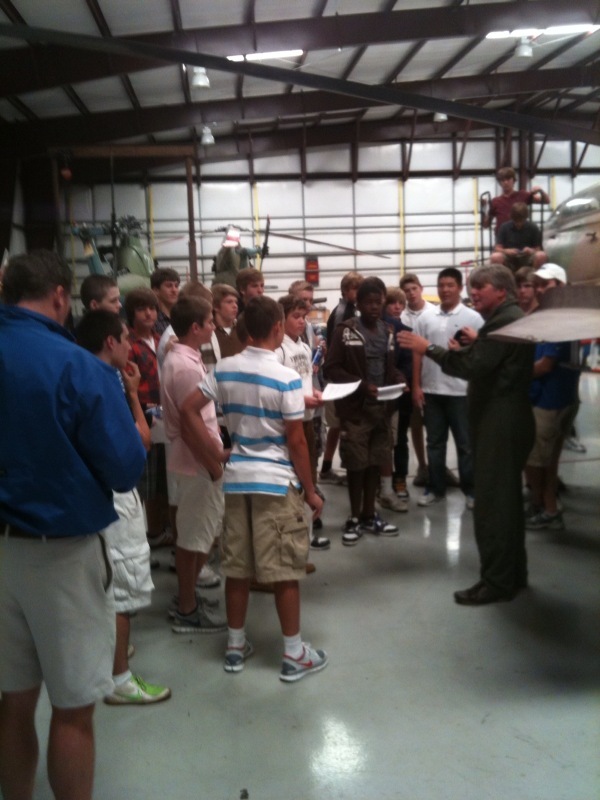 Education and Exhibition are part of the foundation of the Cold War Air Museum mission. Our ability to combine these elements draws groups like the one below to the museum. 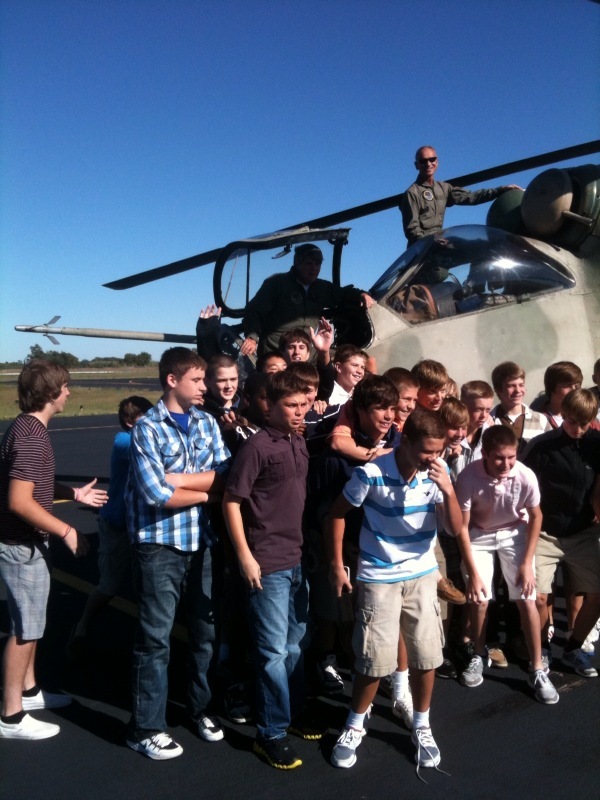 With an environment that supports seeing, touching, hearing and yes, even smelling cold war era aircraft, visitors like this school group will go home with unique memories to link with their history lessons. Students and Associates alike enjoy their visit. Associates and Volunteers at the Museum may not realize that they are already a part of history in these students eyes, but they enjoy having an attentive audience and expect the students will learn from their day's experience. The Cold War Air Museum is open every Saturday from 10 till 4. Admission is free, however visitor donations are gladly accepted!. Tours and special events can be arranged for other times. 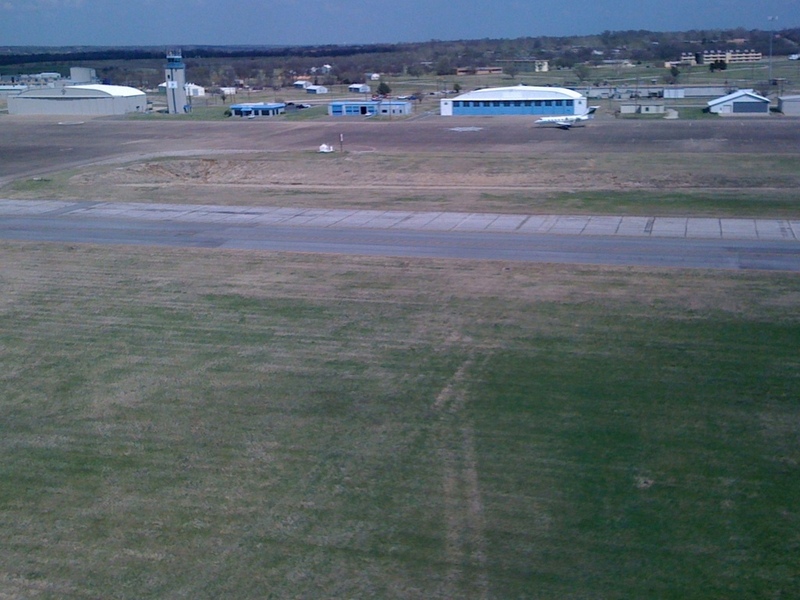 The city, airport and both museums on the field host a number of events at the airport every year. Check our Current Events page from time to time for special events. Driving directions are available on our area map page. 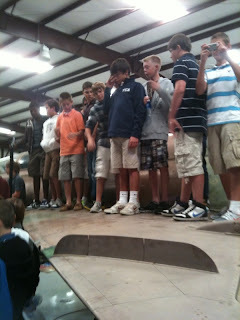 We are fortunate at the Cold War Air Museum to have a fine group of associates and volunteers. Our previous post on Larry, (click on the associates label, below) featured his Bell 47, but it is time for an update since he has upgraded to this beautiful MD500D. 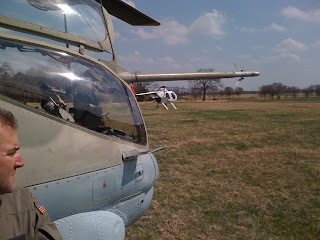 Related to the OH-6 of Vietnam era, this "D" model is distinguishable by it's 5 main rotor blades and "T" tail. Previously employed at the Las Vegas Metropolitan Police Department, N58431 was used for Patrol, Mountain Rescue and Training during it's 25 years of service. Valued for her high availability and "up-time", many were sad to see her go, but departmental policy dictated upgrading the entire fleet to "F" models for improved "hot and high" performance. With thanks to Larry for sharing his story and flying with the Museum, and thanks to Andy Nixon as well for sharing some of his great photo work. We've mentioned the close relationship between the Commerative Air Force (CAF), DFW wing and the Cold War Air Museum at Lancaster Airport in the past. This relationship lets us work together to bring visitors to the airport and our museums. 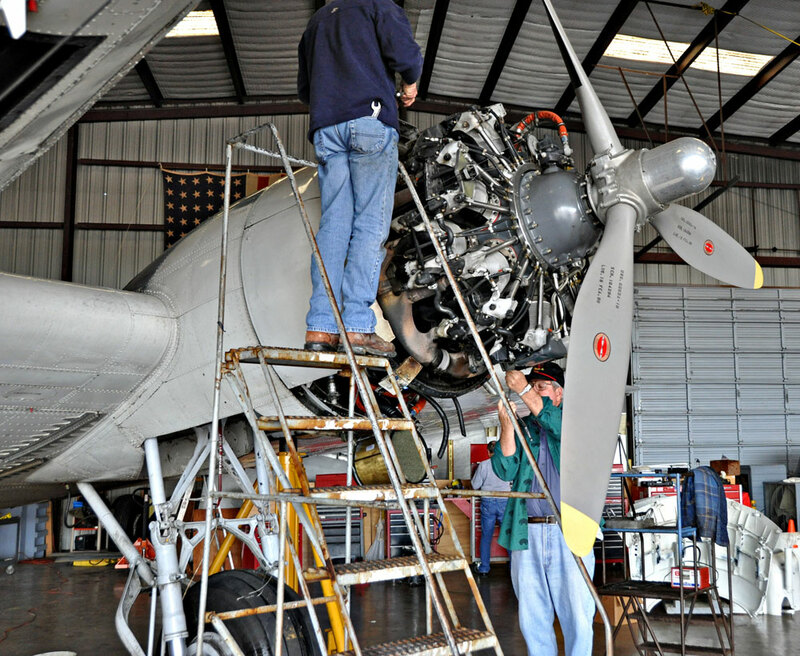 As with our aircraft, maintaining and keeping their aircraft (and the pilots that fly them) current, is a full time job. Jon, one of several Cold War Air Museum directors, who is also a life member of the CAF took this opportunity to exercise his stick and rudder skill in this fine example of flying history that the CAF keeps in top notch condition. Like us, the CAF has a dedicated and skilled crew of volunteers that take care of their aircraft. We appreciate this great working relationship and invite you to visit their web site and facility when you come visit us. With thanks and acknowledgment to the CAF for these fine photos. 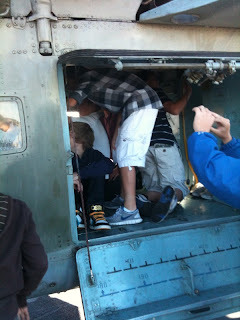 Flying the aircraft at the Cold War Air Museum sometimes seems like a full time job. As someone once said, "That's the kind of problem you want to have." 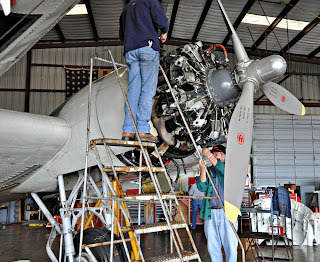 Once aircraft are restored to flying condition, they need to be maintained in flying condition. Doing so requires - "Flying them"! Jon and Sean took the "Chang" up recently because it "needed" to be flown. It was a beautiful day for flying and the two of them enjoyed a short local flight to warm the engine up before the aircraft's annual inspection. 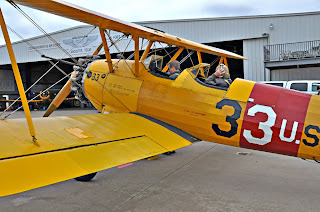 They had a good flight, and as always, visitors to the museum enjoyed the experience of seeing (and hearing) our associated aircraft being flown. 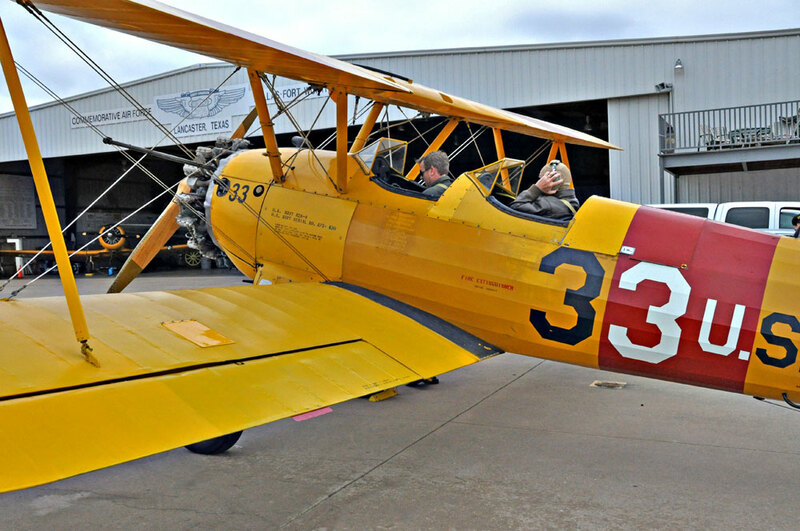 Most weekends, one or more aircraft are being flown at the Cold War Air Museum. 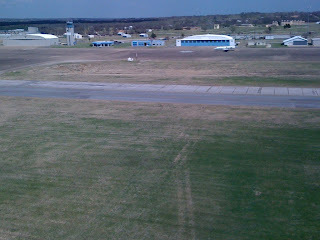 Come visit us at the Lancaster Regional Airport in Dallas. Click our links for driving directions and local events. We never seem to be at a loss for projects around the Cold War Air Museum. 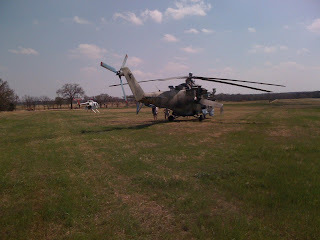 Among other aircraft receiving attention last weekend was Mi-24 Bord 120. 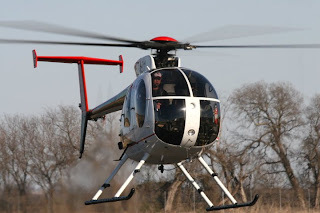 The second, soon to be flying, large Russian (former Bulgarian actually) helicopter based in Texas was scheduled to receive a new set of main rotor blades. This project started with the new blades on the ground and the volunteers full of enthusiasm. The unique experience that these volunteers get working with associates on their aircraft attracts such aircraft enthusiasts. 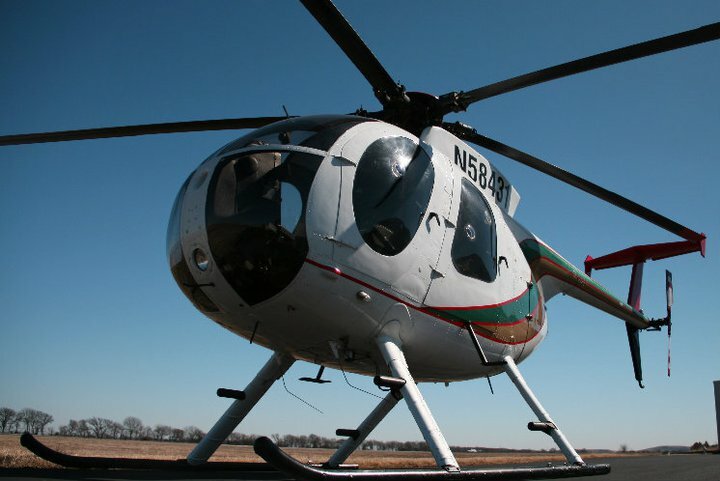 The blades have to be hoisted about 5 meters up and aligned to the main rotor hub before they can be attached. Don't let the look of scepticism fool you, Larry's seen this done before. I think he's just mugging for the camera. We are looking forward to doing articles on each of these associates new aircraft soon. With a "Yo heave ho", a blade is brought over to the scissor lift that will be used to simplify and expedite the process. Improvising is no stranger to this crew. Placed on padded saddles, each blade will be carefully raised and moved up to the hub for mating. On approach, the crew holds her steady. On short final, they are at the proper height and in the groove. With minor adjustment, each blade slides easily into place. Hey Bruce, I've got cyclic and collective here, a blade on top and we're going up and down and back and forth. We are logging this as flight time aren't we? 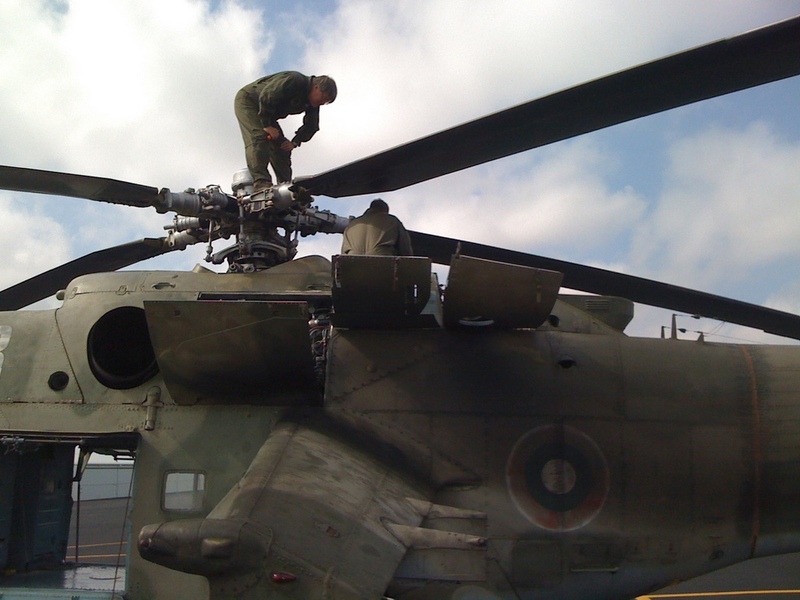 Between helping and watching (with amusement), Johnny takes care of routine maintenance on Mi-2 Bord 211, cleaning the transmission filter. 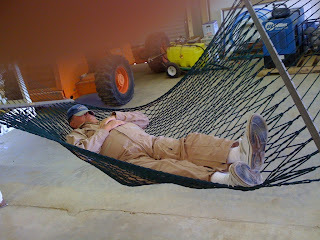 Johnny's motto of "Get 'er done, let's get 'em flying" is well applied here.